In some unstable parts of the world regional warlords, extremist groups, and rebel militias are exploring new and old methods of funding their battle against local ethnic groups, state militaries, and even other rebel groups. By controlling raw natural resource production from local mines some groups have undermined the local and national economy and are using funds to support their insurgency and their crimes against civilian populations. But some groups have also been killing elephants and rhino in huge numbers and exchanging elephant ivory for weapons, food, and much-needed currency. Other related militias, rebel groups, and support networks engage in trafficking of bushmeat as well as the capture of primates for fresh bushmeat or the exotic pet trade. While the exact number of elephants killed by these groups is unknown the Monitoring the Illegal Killing of Elephants (MIKE) program sites monitored by CITES do take into account areas where rebel militias have strong influence or are in complete control. In 2013 more than 9,000 elephant carcasses were documented at MIKE sites (page 32) and an estimated 17,000 elephants were killed within those sites that year. In parts of Central Africa rebel armies and militias fight for independence or for control of regional resources such as gold, diamonds, and rare earth metals. In January of 2013 Enough Project reported evidence (full report) that the Lord’s Resistance Army (LRA), operating in Democratic Republic of Congo, was poaching elephants and trading the ivory for weapons and supplies. In early 2016 there were further allegations made by former members of Joseph Kony’s Lord’s Resistance Army, currently being targeted by U.S. military and associated partners, that the rebel group was both directly involved in elephant poaching and in trading ammunition for ivory acquired by other militias. In August of 2016 the U.S. Department of the Treasury blocked Americans from conducting any transactions with Kony’s sons Salim and Ali and froze their assets. Sanctions against two major LRA sympathizers involved in the supply network, Okot Lukwang and Musa Hatari, followed in December of 2017. Enough Project’s 2013 report corroborated concerns voiced by CITES of well-armed rebel militias being involved in large-scale poaching operations. 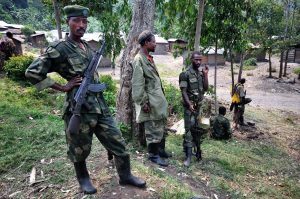 Reports by other groups (page 16) have also documented rebel militias involved in poaching including the Democratic Forces for the Liberation of Rwanda (FDLR) which is led by one of the top military commanders that took part in the Rwandan genocide. An alleged photo of Sylvestre Mudacumura. In the 1990s Sylvestre Mudacumura was a deputy commander of the Rwanda Presidential Guard, one of the battle-hardened groups that would go rogue, and allegedly committing atrocities against ethnic minorities and non-radical political groups within Rwanda. The Rwandan genocide would claim the lives of hundreds of thousands of people and decimate the country’s population. While international courts would eventually bring some of the perpetrators to justice the rebel militias that were formed to carry out atrocities would continue to use their military experience to destabilize regions within central Africa. In 2007 Sylvestre Mudacumura was known to be the head of the military branch of the Forces Démocratiques de Libération du Rwanda (Democratic Forces for the Liberation of Rwanda) a rebel militia operating in eastern parts of the Democratic Republic of Congo and numbering thousands. In the mid-2000s they were reported to be committing atrocities against local civilians and slaughtering elephants to fund its insurgency and terrorist campaigns. In 2010 forces from the FDLR and Mai-Mai rebel groups occupied Luvungi, North Kivu and perpetrated heinous crimes against the women in the town. In 2015 the Congolese Army continues to fight against these rebel groups, still numbering over a thousand, and win back control of former rebel-occupied areas. The Monitoring the Illegal Killing of Elephants (MIKE) program monitored by CITES counts the number of elephant carcasses found in those sites and extrapolates the total number killed in those areas and throughout Africa based on reliable data. Killings at MIKE sites (page 35) in DRC’s Virunga National Park and Kahuzi-Biega National Park have loosely corroborated evidence of extreme elephant poaching due to regional violence. Virunga officials continue to report poaching incidents, ambushes, and deaths of rangers, by suspected Mai-Mai rebel groups. Mali’s elephants are relatively few in number, but are the northernmost herds on the African continent. Over the past couple of decades they have been subjected to a changing environment and increasing human encroachment on their historic range. However the Mali Elephant Project has worked to restore the ecosystem and collaborate with the people in the region to find an equilibrium suitable for everyone. One of the locals, who are largely subsistence farmers, said “we don’t want elephants to disappear because if elephants disappear it means the environment is not good for us” (watch the full TEDx video here). In 2007 a rebellion began seeking regional autonomy or a complete independence, with rebel groups blamed for killing elephants to fund their initiative and at the same time terrorizing the local people. The fighting ended in 2009, only to begin again with the formation of the Mouvement National de Libération de l’Azawad (National Movement for the Liberation of Azawad), MNLA, a year or two later. Since then fighters, armed with weapons acquired during the Libyan civil war (2011), have been recruited into the MNLA and al-Qaeda linked groups in the region. 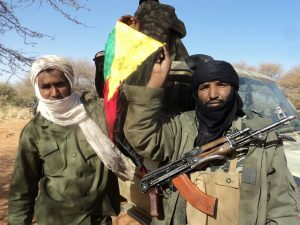 Despite separatists and the Mali government signing a ceasefire agreement an attack on protesters by government forces reignited the conflict and threatens to again see local wildlife be exploited by anti-government forces. An assault by gunmen on a hotel in Bamako, the capital of Mali, made world headlines in late 2015 when 170 people were taken hostage and at least 20 killed by a coalition of jihadists and Islamic separatists. In the wake of the attacks local Malians renewed their commitment to supporting elephant conservation as a means of increasing the security and economic viability of the region. Locals of Gourma cited the Mali Elephant Project as a valuable direct-impact program allowing young people an opportunity to make an honest, stable living instead of contributing to the country’s turmoil.